MamaBreak: Food Should Taste Good! NEW Favorite snack of hubby and kiddo is the Food Should Taste Good Sweet Potato chips. 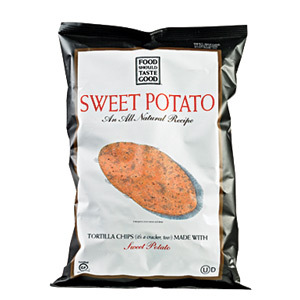 A delicious tasting tortilla chip made with....Sweet Potatoes! Yes, you heard it right! These are super snacks with a black bean corn salsa or even just plain! My family loves that these chips are made with non-GMO ingredients and are gluten free. While none of our family has an allergy to gluten, it's nice to get a snack and chip product without it. I'll save the gluten for another snack! If you are interested in trying these out, checkout their website and other products too! There are some pretty awesome crackers, too!